Welcome to the BOSP Bancshares website. 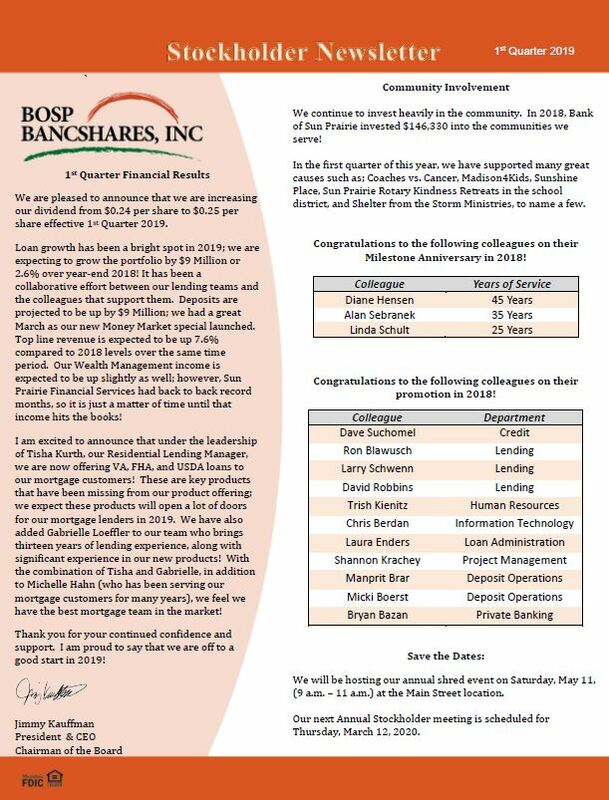 BOSP Bancshares is the holding company for Bank of Sun Prairie in Sun Prairie and Cottage Grove, Wisconsin. To learn more about Bank of Sun Prairie, visit our website at www.bankofsunprairie.com. This site is intended exclusively for potential buyers and sellers of BOSP Bancshares stock. We encourage to you to review all applicable statements and documents prior to submitting information. For questions or additional information, Contact Us directly. Click to view the downloadable forms on the Documents page. BOSP Bancshares is the parent company of Bank of Sun Prairie* an independent community bank with locations in Sun Prairie and Cottage Grove Wisconsin. Our financial institution has been serving local customers, business owners and agribusiness for more than 100 years. We offer the latest in online banking, checking and savings accounts, great mortgage rates, CDs, personal and auto loans, home equity loans, along with wealth management and financial services. The bank is locally owned, so decisions are made locally. We have worked hard to earn our reputation as one of the most highly respected banks in Dane County. Visit us today and experience The Right Balance.